Home › News› Armen-Ontario of AGBU Inc. gifting to Sick Kids, other non-profit organizations supporting AGBU’s mission, as well as AGBU Programs. Armen-Ontario of AGBU Inc. gifting to Sick Kids, other non-profit organizations supporting AGBU’s mission, as well as AGBU Programs. Armen-Ontario of AGBU is committed to making a difference in the lives of Armenians and in their local communities. 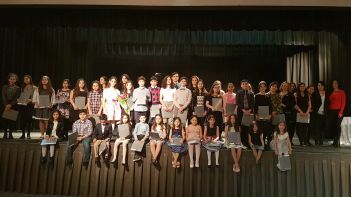 Armen-Ontario of AGBU Inc. has extended its support to the Toronto Armenian Community including payment in full the tuition for ten students, whose families have fled the Syrian War, so that they may study at Holy Trinity Armenian Church’s St. Sahag and St. Mesrob Saturday School of Toronto. Moreover it has supported the Saturday School of St. Gregory’s Armenian Catholic Church with a donation of $5,000. We truly believe that in both Saturday Schools, the students will engage in enriching studies and activities that will enable them to enhance their culture and develop their native tongue. AGBU’s programs and assistance extends beyond the Armenian community. Chapters contribute funds and dedicate efforts to helping their local cities and larger communities. In 2018 we were honored to have the opportunity to help Sick Kids Hospital make a difference in the lives of many children. Armen-Ontario of AGBU Inc. directed $5,000 to the CHILD BRIGHT program in paediatric neurology. This research department was brought to our attention through the work of Dr. Berge Minassian. We are also pleased that this donation will qualify for the Federal Government’s matching gift program. In its efforts to enrich the lives of underprivileged children through enhanced educational experiences, Armen-Ontario also contributed $16,426 to the Children’s Centres in Armenia to benefit the Afterschool Reimagined Campaign. Donations to these Centres empower these children by strengthening their personal growth and development. Contributions to the AGBU Afterschool Reimagined Campaign help give way to complete renovations to the Children’s Centres, located in the Yerevan districts of Arapkir, Malatya and Nork, with upgrades to the Malatya Center already underway. Together, the centres represent a future full of possibilities and special experiences for young ones in Armenia. -parents the reassurance that their child is flourishing in a nurturing environment. As exemplified above, education has always been an important focus of AGBU’s mission. Through our long history, we have ensured that we continually inspire and empower our young scholars to pursue careers that they are impassioned by, and to remain avidly cognizant of their culturally rich background. With that in mind we have awarded $42,524 in scholarships to deserving university students. We continuously receive notes of appreciation for the support individuals have received in fulfilling their personal goals of growth. For further information, please contact our office at 416-431-2428.